Hazel is 17-years old and has been living with cancer in her lungs since she was 13. Her family believed her to be depressed seeing as she didn’t spend any time with friends and spent a lot of her time thinking about death. But that all changed one day in her support group when she first met Augustus Waters. Augustus, is a hot young guy with a great smile and happens to be recently cancer free. At first sight Augustus literally can’t take his eyes off Hazel. The two soon become an odd type of friends. Hazel doesn’t want to like him as much as she does because of her unstable state. But Augustus has a different view. See what happens to Hazel and Augustus in The Fault in Our Stars By John Green. I LOVED The Fault in Our Stars by John Green. I could not put it down (that made for some late nights and getting to school late). I plan to read it many more times. It is so perfect I can’t find it in me to put it in my book pile (I have all my books in a pile), at the moment it is sitting on my night table even though I finished it well over 2-weeks ago. John Green is an AMAZING writer. I would suggest any of his books (Looking for Alaska and Paper Towns book reviews later). Though his writing contains some cursing and mature subjects, it is really good. I think The Fault in Our Stars is a book everyone should read at some point in there life. I would say that anyone under 10 shouldn’t read it. This is a touching and truthful and defiantly not sugar coated (at any point) story. The characters are great and you really fall in love with them. Warning: it’s a bit of a teary book, have tissues near by! The Fault in Our Stars is told from the point of view of Hazel Grace. She is a girl and it’s written by a boy, which causes some interesting thoughts! 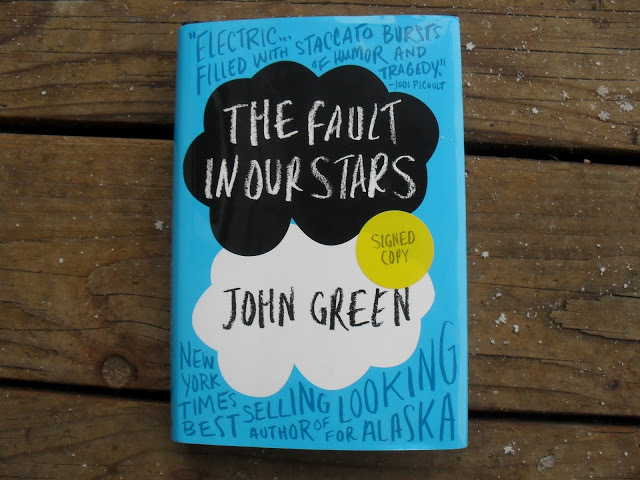 I would give The fault in Our Stars by John Green, a 9.9 out of 10. The Fault in Our Stars is being made into a movie, which I’m VERY excited about. The movie comes out June 6, 2014 so you have some time to read it before then. The trailer was recently released click on this link to see it. Also as a side note, it’s Spirit Week at my school and tomorrow is come in as a favorite book characters day. So I’m going as Isaac (a boy from The Fault in Our Stars) my friend Kiki is going as Augustus (One of the main characters who is a dude from The Fault in Our Stars) and my friend Ali is going as Hazel (The main character of The Fault in Our Stars). Yes, me and Kiki are girls and yes we are going as boys but who cares. What are your thoughts in The Fault in Our Stars? Have you read it? Do you have any book suggestions for me or book reviews? ?